Halloween is over. It’s time to put away the costumes and ghoulish make-up, pack-up the spooky decorations, and toss your jack-o-lantern in with the composting. And, whether it’s because you didn’t have enough kids ringing the doorbell, or because you “accidently” (wink, wink) bought too much; you most likely have at least a little bit of leftover candy. I don’t know if that’s a good thing or a bad thing, but however you classify it – it should be enough to keep you going until the Christmas baking season begins. 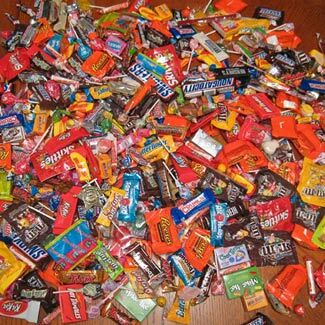 Last week we talked about the finer points of trading Halloween candy among trick-or-treaters. No matter how well your kids did in the trade, odds are they walked away with more candy than you want them to have. Trying to get them to give it up could lead to a monster-sized argument. That’s why, in my house, we call upon “The Candy Fairy”. The Candy Fairy works a lot like the tooth fairy. Your child writes a request to the Candy Fairy asking for a toy or other non-edible item they would be willing to sacrifice their Halloween candy to get. Then they leave the note with the bag of candy. Voila! The candy is magically replaced by the requested toy. As a personal note here, my husband and I had to provide very specific parameters (based upon quantity and quality of leftover candies) as to what type/cost of toy could be requested by my daughter. As the product of two lawyers she became very skilled at the art of negotiation. She would even squirrel away candy from Valentine’s Day, her Christmas stocking, Easter, or any other “candy occasion” – all in an effort to bulk up her bargaining power with the Candy Fairy. To Devour or Not To Devour. . . Some parents have decided it’s okay to let their kids devour all the Halloween candy they bring home. This is based on the idea that it’s actually is a healthy thing (in a bad for you sort of way). 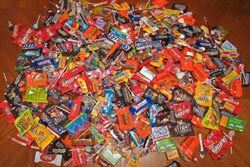 The theory is that the deprivation or restriction of candy backfires and causes the children to want candy even more. You can read more about it by clicking here. This article also discusses yet a third option for your leftover Halloween candy: science experiments. Did you know that you can put a Skittle in water and the “s” will float to the top? Given that we’re closing the chapter on Halloween and heading into Veteran’s Day, it got me thinking about the “Skittles Effect” (not to be confused with the “Skittles Touch” where everything the man touches turns into Skittles; click here to see the Skittles Touch. 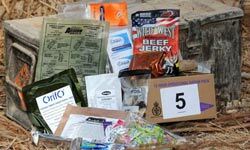 The “Skittles Effect” is a “morale-boosting effect that makes the soldier feel good [when they see a recognizable product in their rations] because they feel like they’re not so far from home.” D’Andrea Bros., LLC v. U.S., 109 Fed. Cl. 243, 258 (Fed. Cl. 2013). Yes, this is really a quote from testimony in a real court case. The government, for its part, agreed under the CRADA to engage in cooperative research and to help D’Andrea test and improve Natick’s HooAH! rations bar. The first two years of the CRADA worked out beautifully, but then. . .
D’Andrea then began to explore trademarking the name “OORAH,” the Marine Corps battle cry. 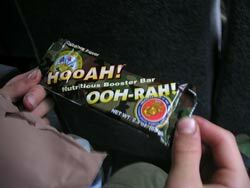 The name “OOH–RAH!” was being used on ration energy bars at that time, so that the military’s ration energy bars were being called “HooAH!/OOH–RAH!” bars to accommodate the Marine Corps, which objected to the sole use of “HooAH!”—the Army’s battle cry—on the military energy bars. In order to accommodate the Marine Corps and eliminate the “OORAH” trademark issue with D’Andrea, the government changed the name of the bar to “First Strike” during the five-year contract. D’Andrea sought approximately $1.95 million in reliance damages for the government’s alleged breach of the implied covenant of good faith and fair dealing inherent in the CRADA. The government in a counterclaim is seeking approximately $60,000 for unpaid royalties. D’Andrea presented evidence that the government breached the implied covenant of good faith and fair dealing inherent in the CRADA by unreasonably failing to communicate with plaintiff from January 2007 to September 2007, by changing the name of its military energy bar from “HooAH!” to “First Strike” during the CRADA period, and by “bad mouthing” and electing to compete with plaintiff by developing its own bar within the military feeding community. The government introduced evidence to show D’Andrea’s damages were not the result of any of the government’s actions under the CRADA. Rather, the government’s witnesses testified D’Andrea would have sustained the losses identified as damages regardless of whether the government breached the CRADA. According to the government, D’Andrea had over-estimated the market value of the HooAH! name and was simply unable, in the five-year period guaranteed by the CRADA, to successfully establish the bar in the commercial market. Finally, the government presented evidence to show D’Andrea failed to comply with the royalty provisions of the CRADA for the fourth and fifth year of that agreement, and as a result owed the government a total of $59,294.72, representing the royalty payments due plus interest. The implied covenant of good faith and fair dealing guarantees a party (here the government) will not interfere with the other party’s performance and not act so as to destroy the reasonable expectations of the other party regarding the fruits of the contract. “Implied” or “inherent” means you don’t have to have this legal duty written out in a contract for it to apply. It includes a duty to cooperate and a duty not to hinder another party’s performance of the contract. The duty of good faith and fair dealing can also include an unreasonable failure to cooperate (but it does not include all types of “misbehavior”). Want to know more? Ask us about contract drafting or our Service Disabled Veteran Owned Small Business Packages.